Grey Arnhem 1-Light Glazed Door imperial sizes. A solid internal door with two bold panels. One is solid and one glazed. Also it has deep opulent mouldings. Even more striking in this very modern Silk Grey Veneer design. The Grey Arnhem 1-Light Glazed is suitable for all living areas of the home. Including dining room, living room, snug etc. Anywhere that privacy is not an issue. The sheer boldness of the design creates a very distinctive contemporary effect. The Grey colour match is RAL 7044. This is a very modern design and colourway, very popular with interior designers at the moment. Also particularly suitable for commercial situations. It is a perfect match for its FD30 fire door twin and also the standard 35mm version. A Pre-finished, engineered door which is ready to hang. Further it has an engineered, solid core (weight 28kg) with 10 mm lippings all round. It comes with a manufacturer’s 10-year warranty. You can make final adjustments on all sides up to 6mm. Hence making it a perfect fit for new and existing door frames. Hinges and door handles are not included. We recommend a minimum of three hinges for this door. 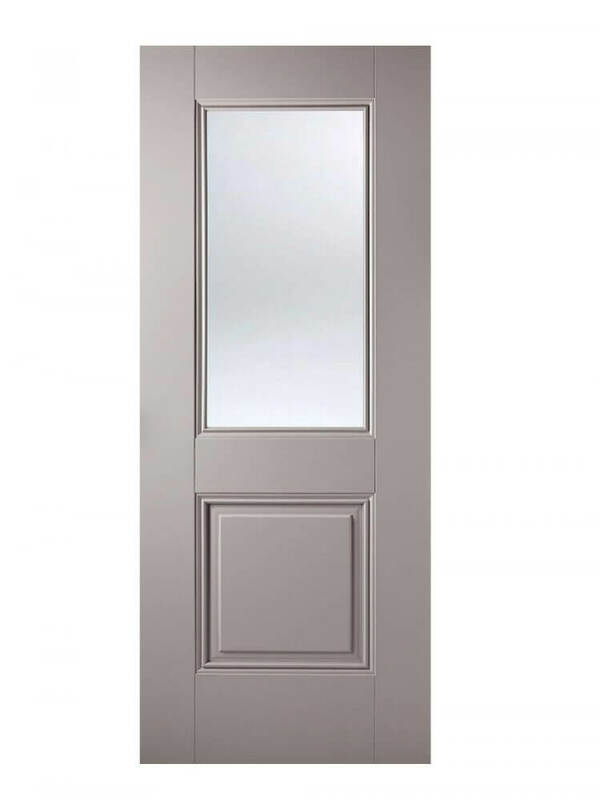 As well as this Grey Arnhem 1-Light Glazed Door imperial the range includes an Internal FD30 Fire Door and a standard variant too! There is a door available for any possible situation. Use the glazed variant for areas which do not get enough natural light. And use the FD30 fire door version where specified by your building control or architect.